In 2015, which must have been the last time I put effort into Hallow’s Eve, I put together a blog post that showed my progress through it. 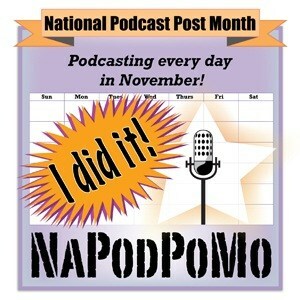 This year, I ran out of time before I had to leave for BlizzCon (and the event ended before I got back home.) 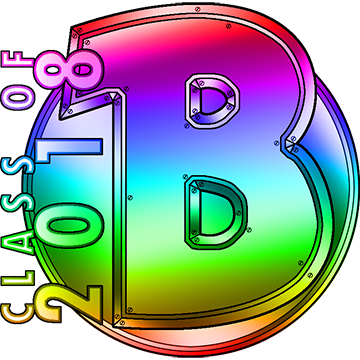 This is not a complaint – I had a wonderful time at BlizzCon 2018. It is simply an observation. 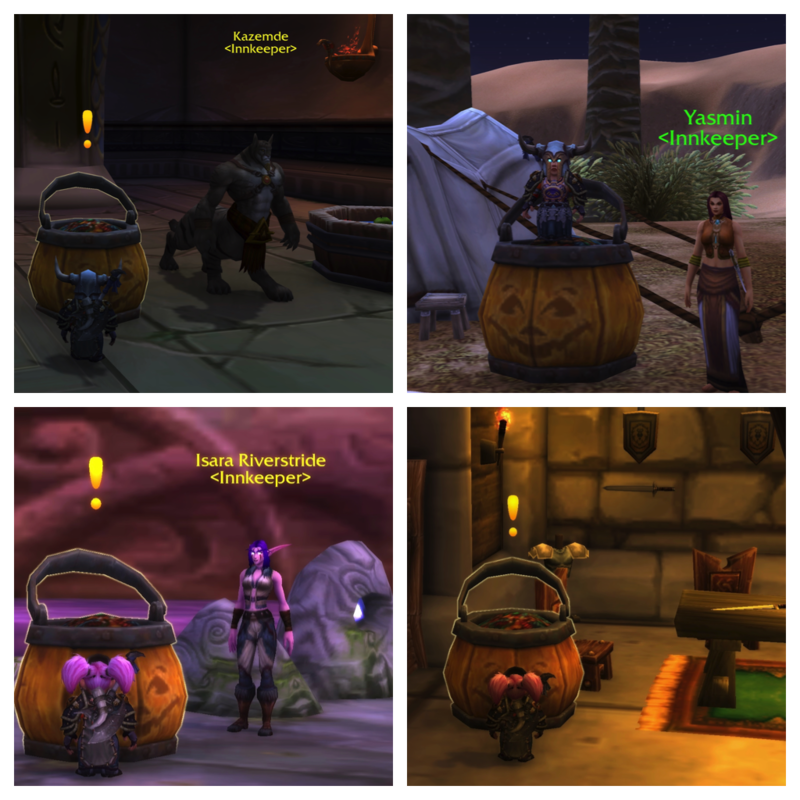 Last year, Riglee visited the Candy Buckets at: Firebeard’s Patrol, Twilight Highlands; Victor’s Point, Twilight Highlands; and Thundarmar, Twilight Highlands. 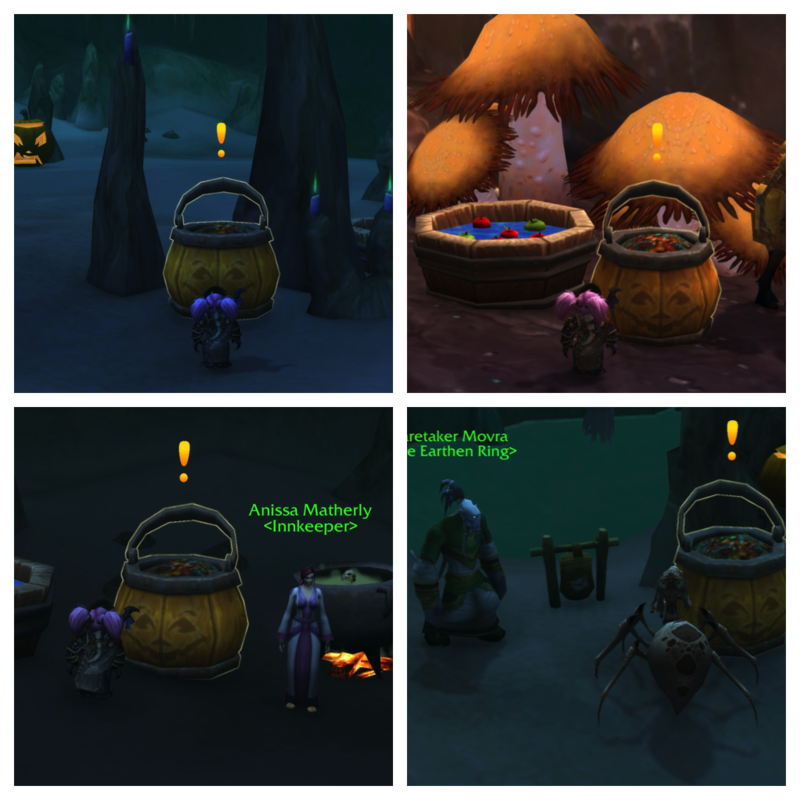 I’m missing a few screenshots of some of the other Candy Bucket locations in the Cataclysm zones. It is possible I was too tired to remember to take those screenshots. Or, they might have gotten lost in the pile of other World of Warcraft screenshots. I will update this blog post if, one day, I find where those screenshots went. 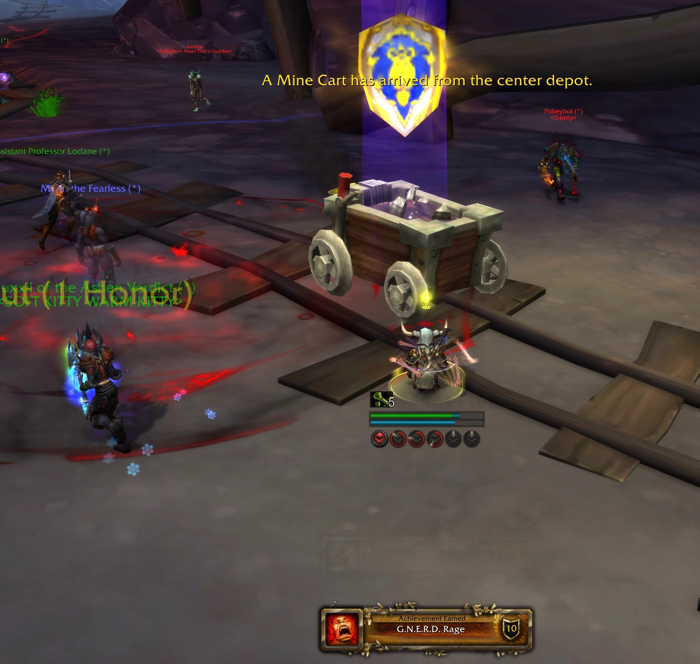 I earned the Tricks and Treats of Cataclysm Achievement! 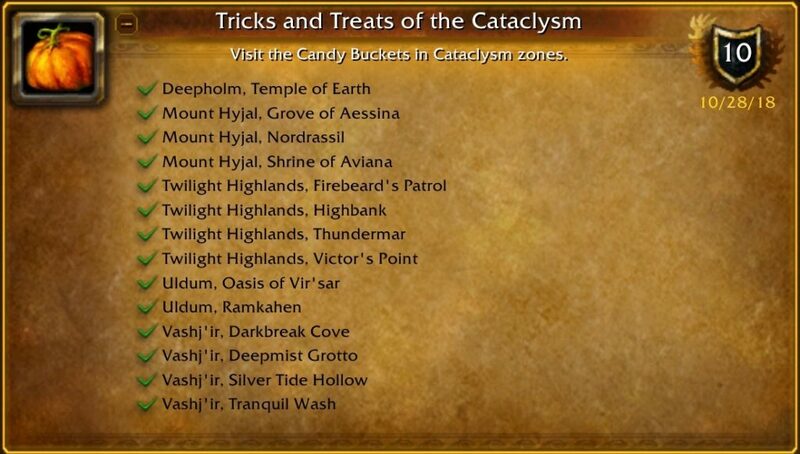 Tricks and Treats of Cataclysm: Visit the Candy Buckets in Cataclysm zones. 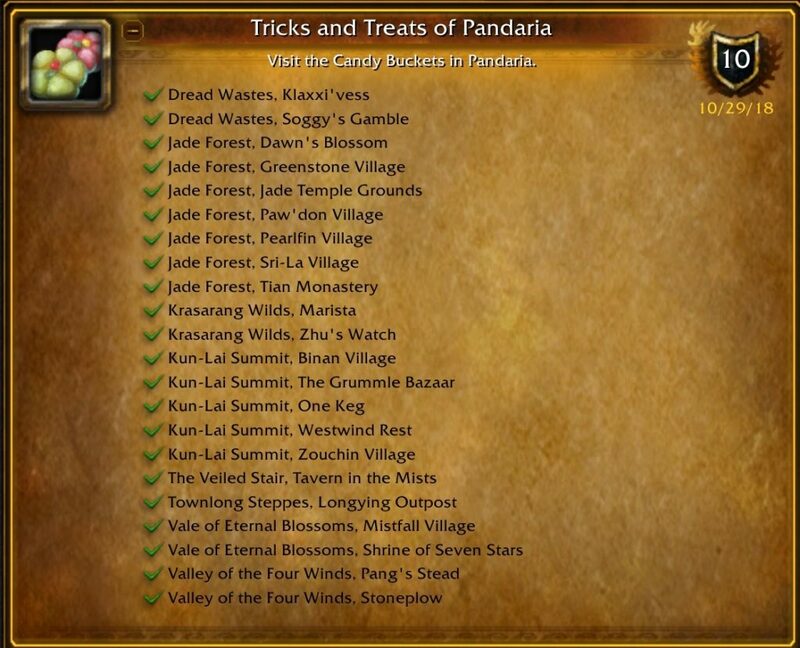 There are more Candy Bucket locations in Pandaria that are required in order to complete Tricks and Treats of Pandaria achievement. I seem to have lost some of my screenshots. This is likely because I was playing while tired. 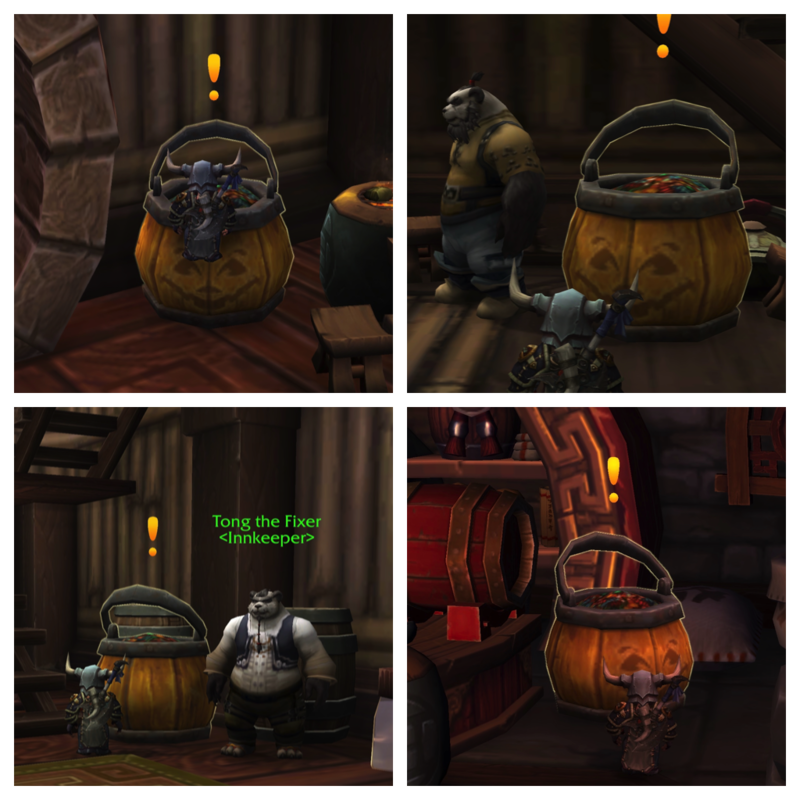 The Candy Bucket at Westwind Rest, in the Kun-Lai Summit, is a difficult one to get to. 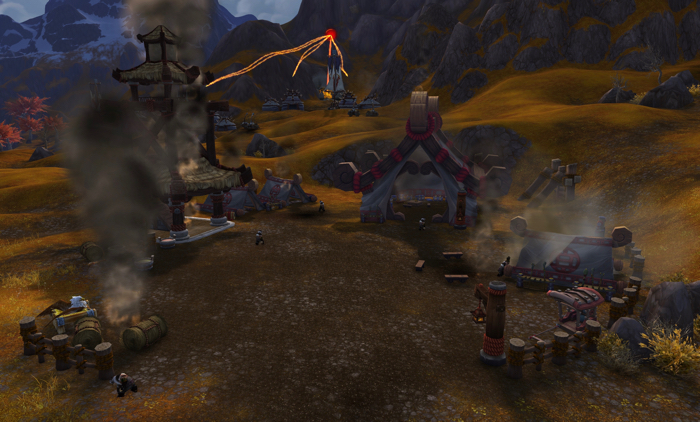 When my Gnome Death Knight arrived at that town – it was on fire. There were no NPCs there (because they had evacuated). There was no Candy Bucket. First, go to Binan Village, in the Kun-Lai Summit. Look for an NPC named Mayor Bramblestaff. He should have a quest for you. I cannot remember if he has this quest right away, or if you have to complete a few other quests first. If he doesn’t have a quest for you, go outside the village and complete the quests from the NPCs out there. Then, go back to Mayor Bramblestaff. 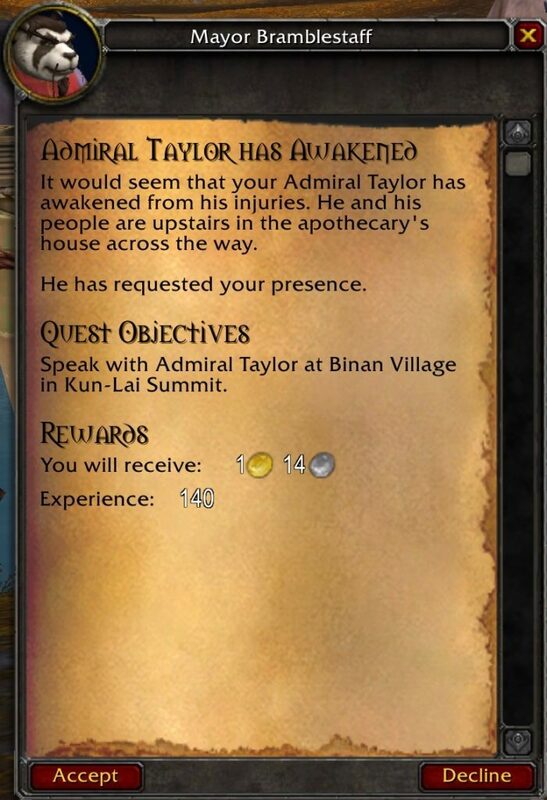 Mayor Bramblestaff: It would seem that your Admiral Taylor has awakened from his injuries. He and his people are upstairs in the apothecary’s house across the way. He has requested your presence. Go into the apothecary’s house. Climb up the stairs. Admiral Taylor and a few other Alliance characters are up there. 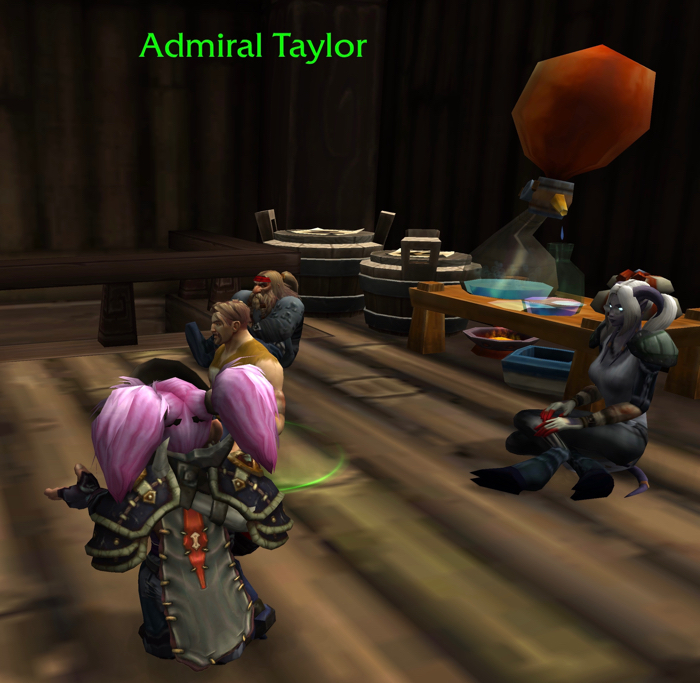 Admiral Taylor is the human who is sitting on the floor. He’s yelling an an Orc (and two Horde characters) who are sitting on the floor across the room. I have no idea what the story-line is here, because I’ve been going through the content randomly. Admiral Taylor: Riglee, is that you? I can’t believe we survived the destruction of the Jade Serpent. Some of us anyway. 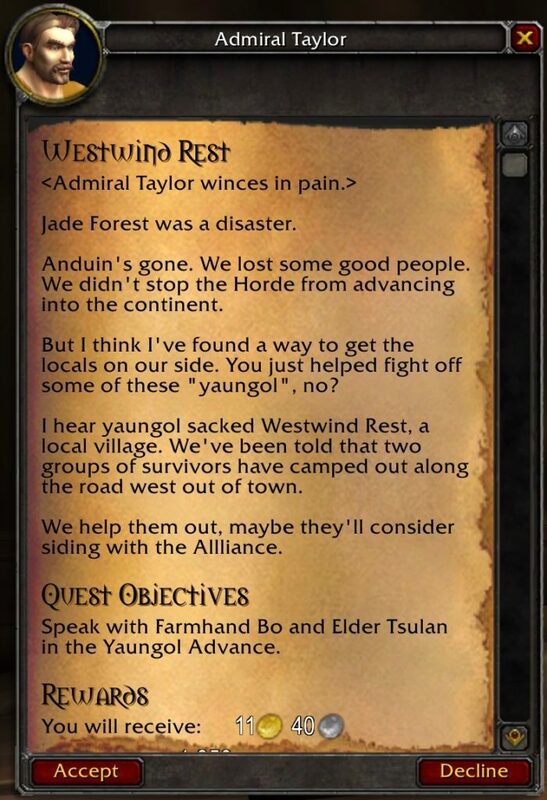 Admiral Taylor: Jade Forest was a disaster. Anduin’s gone. We lost some good people. 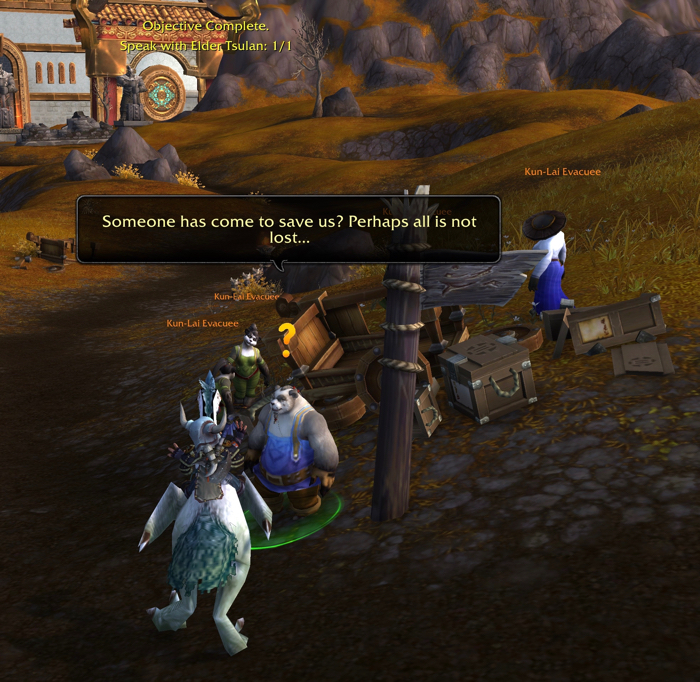 We didn’t stop the Horde from advancing into the continent. But I think I’ve found a way to get the locals on our side. You just helped fight off some of these “yaungol”, no? 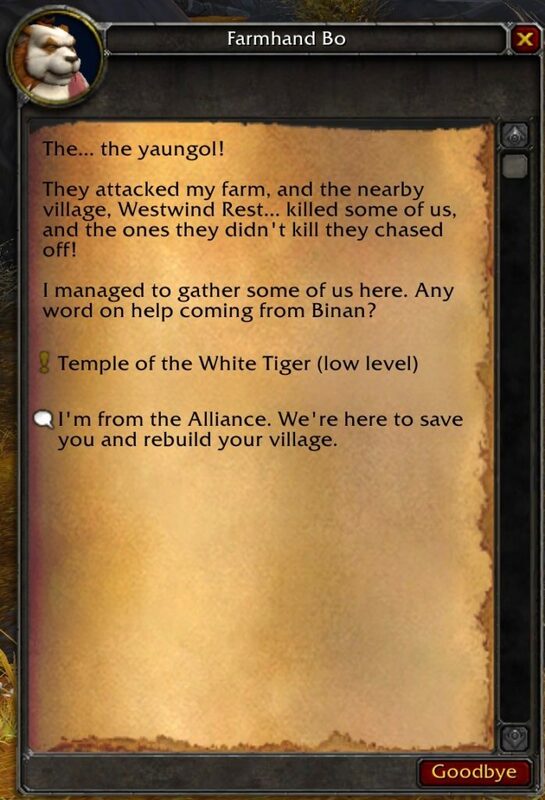 I hear yaungol sacked Westwind Rest, a local village. We’ve been told that two groups of survivors have camped out along the road west out of town. 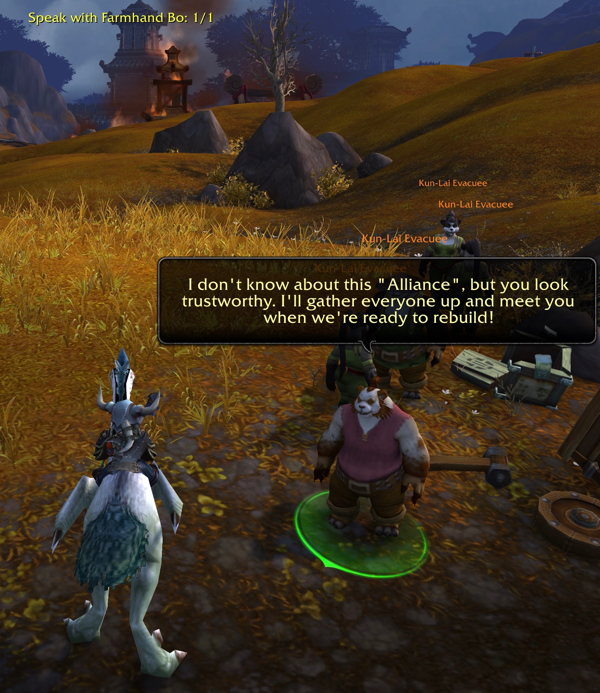 We help them out, maybe they’ll consider siding with the Alliance. 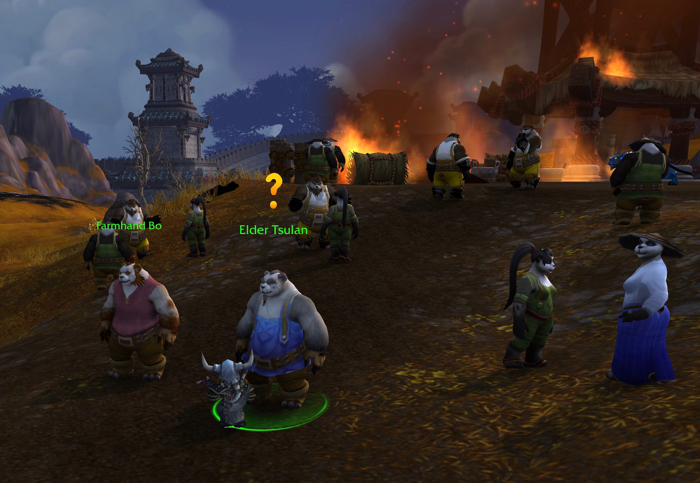 Farmhand Bo: The… the yaungol! They attacked my farm, and the nearby village, Westwind Rest… killed some of us, and the ones they didn’t kill they chased off. I managed to gather some of us here. Any word on help coming from Binan? The player needs to click on the part that says: I’m from the Alliance. We’re here to save you and rebuild your village. 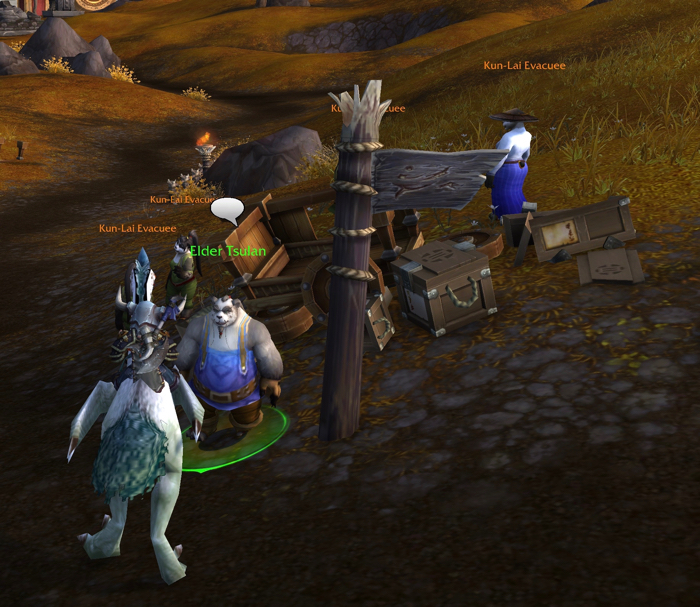 Farmhand Bo: I don’t know about this “Alliance”, but you look trustworthy. I’ll gather everyone up and meet you when we’re ready to rebuild! Next, you need to go find Elder Tsulan. He’s standing by the road (in a different spot from where you found Farmhand Bo). A group of Kun-Lai evacuees is there with Elder Tsulan. Elder Tsulan: As dark as things seem, I must not give up hope. We must not be cowed by the violence of the Yaungol. You… have come to help us? 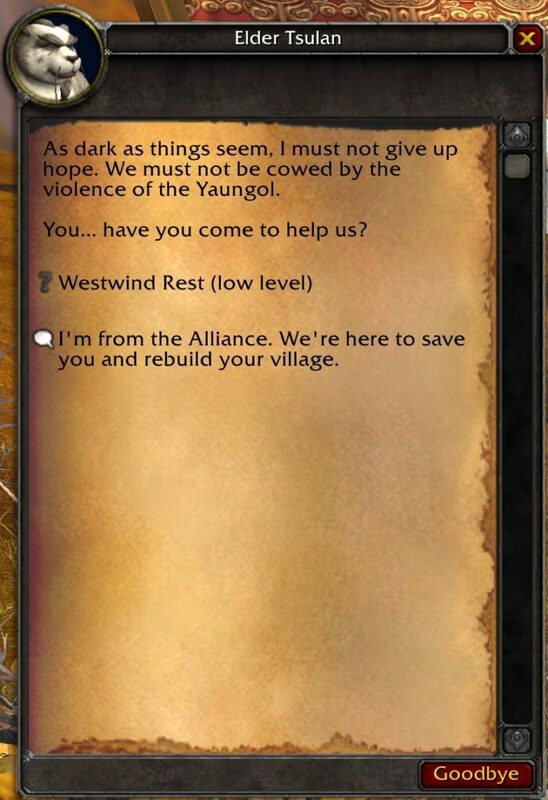 The player must click on the part that says: I’m from the Alliance. We’re here to save you and rebuild your village. Elder Tsulan: I will not rest until our people are returned and this village rebuilt. Elder Tsulan: Well… we are alive, and that is better than we could have hoped for without your help. But, if this is truly to become a base of operations for you, and if we are to join your Alliance, there is one more thing you must do to guarantee our security. Elder Tsulan: The yanguol have always been a difficult proud people, but never this violent or aggressive. I do not know what has prompted this change in their behavior, but we don’t have time to find out, now. We fear for our lives and livelihoods as long as Ur-Bataar, leader of the Batarri yaungol, lives. Go, set the banner in his camp ablaze to challenge him, and then defeat him in battle. Only then will we be secure. Ur-Bataar: No! Kun-Lai was ours…. Elder Tsulan: You did it! At the very least, we have justice and safety, though in the process we have lost so much. Regardless, it has been decided. 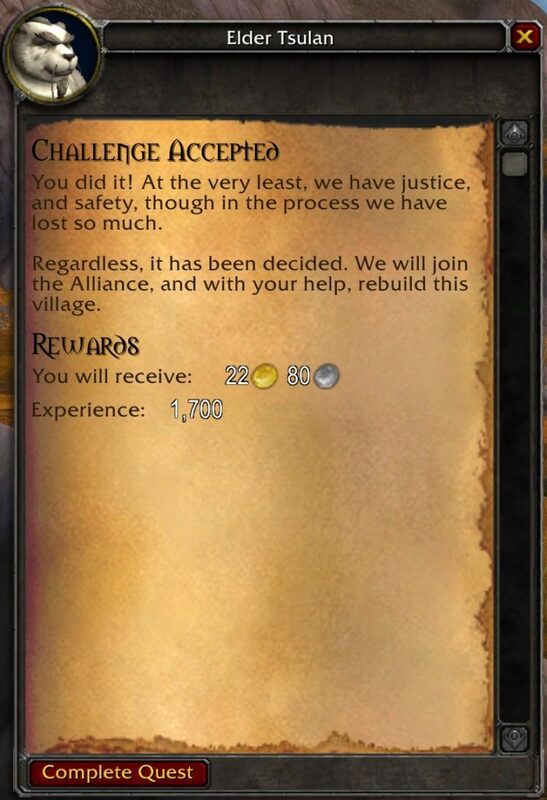 We will join the Alliance, and with your help, rebuild this village. I earned the Westwind Rest Achievement. A cinematic plays. 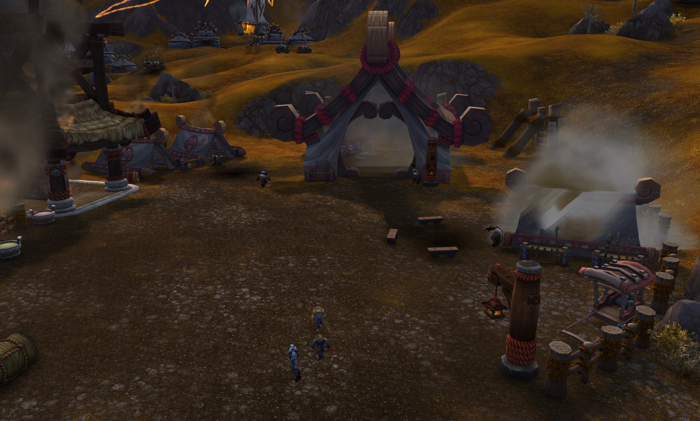 It starts with Westwind Rest very much on fire. Pandarans rush in and start putting out the fires. Admiral Taylor and his team arrive. Westwind Rest has become an Alliance town. 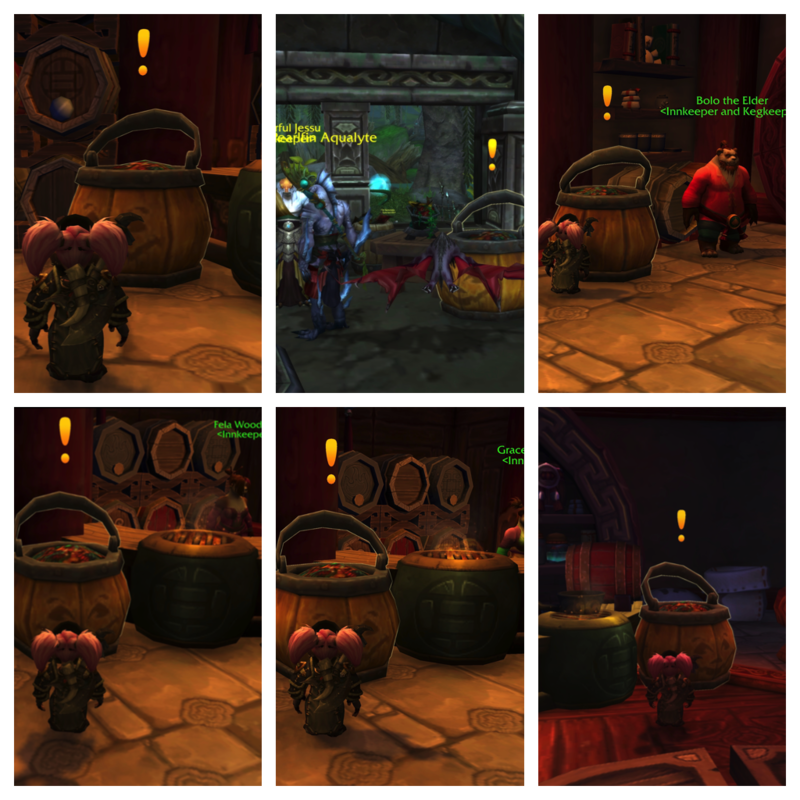 It is now possible to loot the Candy Bucket at Westwind Rest. 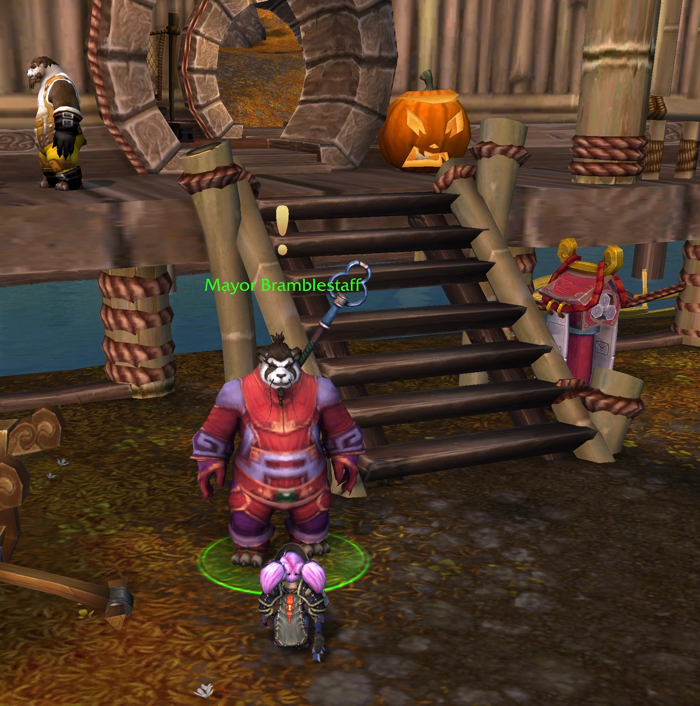 I earned the Tricks and Treats of Pandaria Achievement. 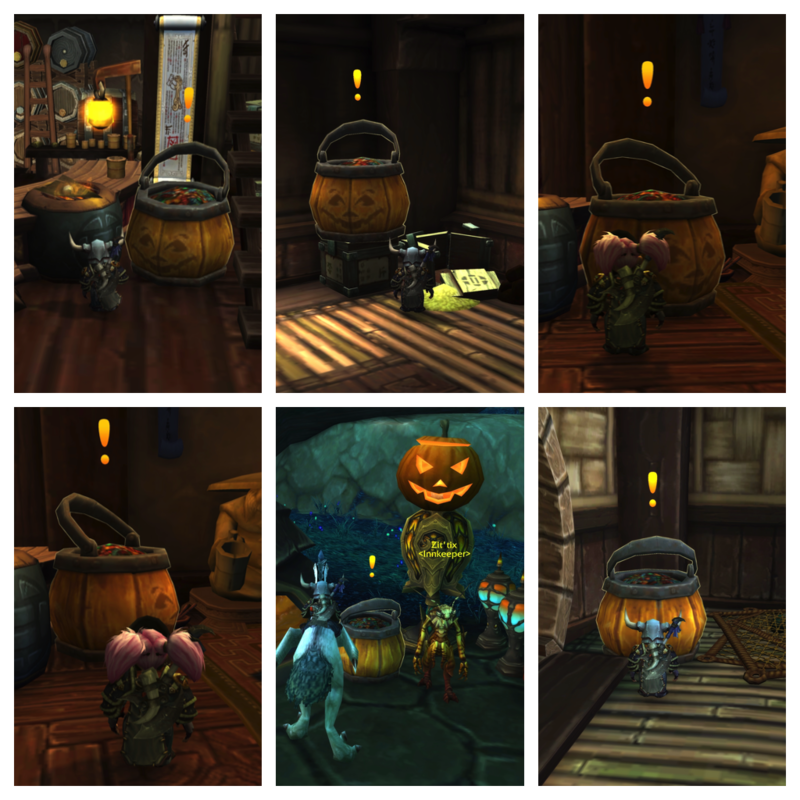 Tricks and Treats of Pandaria: Visit the Candy Buckets in Pandaria. 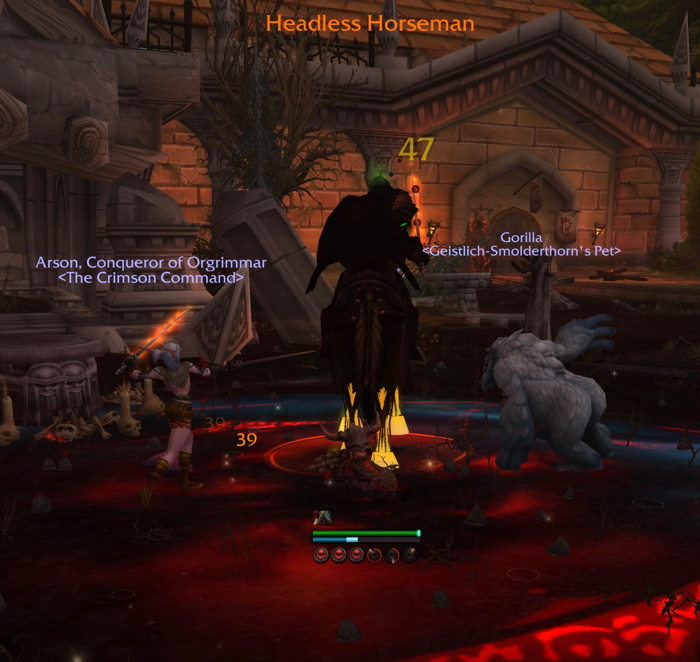 This Hallow’s Eve was the first time I was able to get one of my characters into the Headless Horseman fight. In previous years, all of them were too low a level to participate. 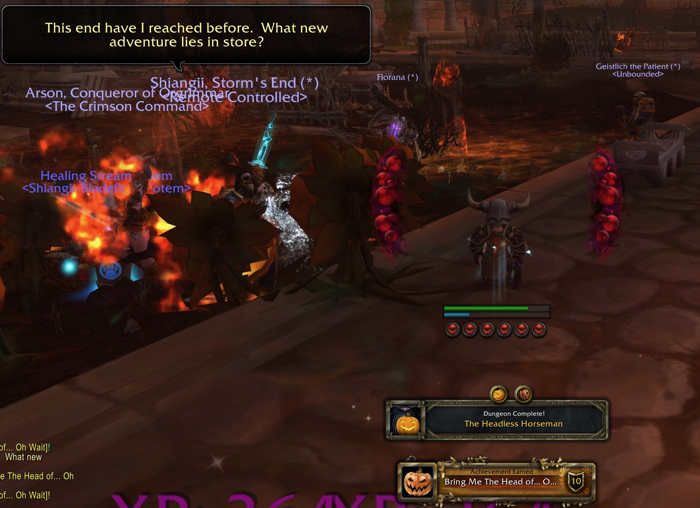 I completed The Headless Horseman Dungeons, and earned an Achievement. Bring Me The Head of… Oh Wait: Kill the Headless Horseman. 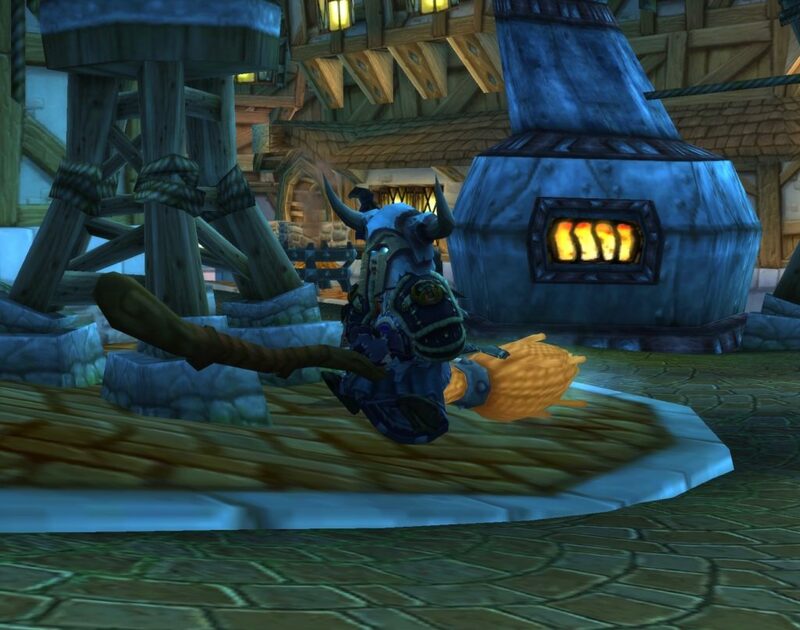 The Loot Filled Pumpkin that I got after killing The Headless Horseman included one of those awesome flying brooms. Fun! I attempted to complete the G.N.E.R.D. Rage achievement in during previous Hallow’s Eve events, but I guess it wasn’t a priority. 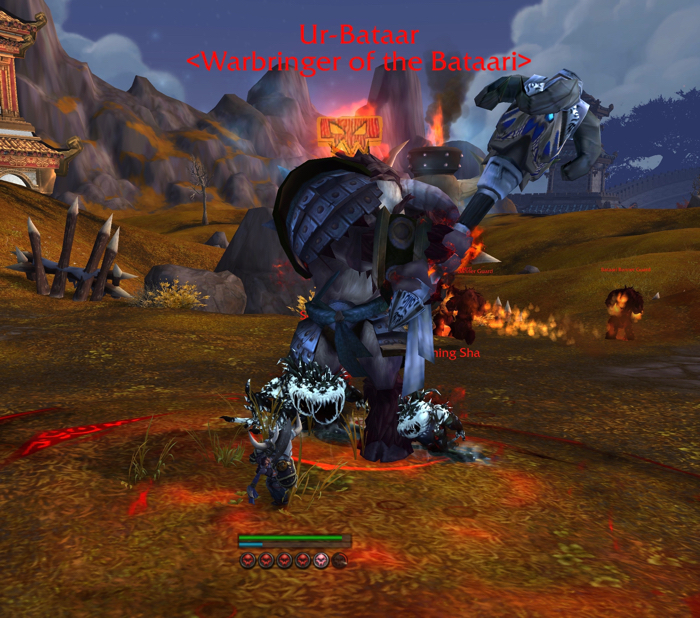 This year, I decided it was worth getting into a random battleground where I could do some PVP. With a little effort, I was able to complete the G.N.E.R.D. Rage Achievement. G.N.E.R.D. Rage: Earn 10 honorable kills while under the influence of the G.N.E.R.D. buff. It’s a slap in the face! It turned out that the G.N.E.R.D. Rage Achievement was the last one I needed to complete the Hallow’s End event. 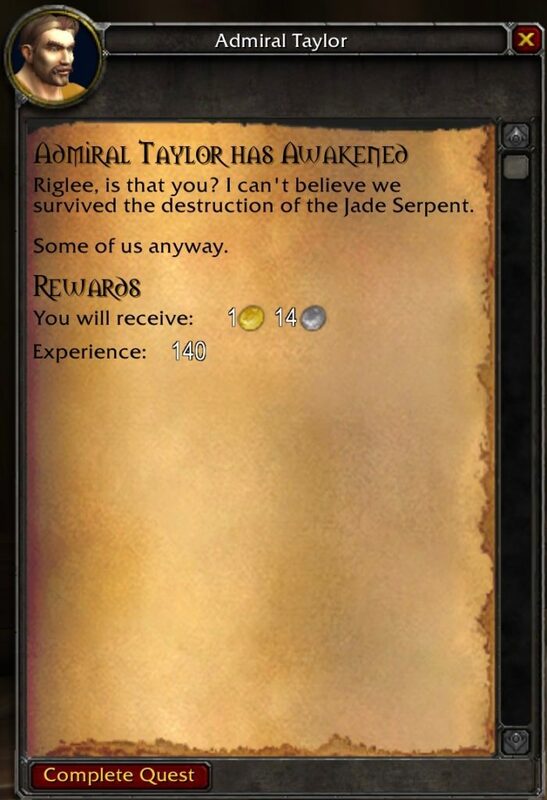 The text says Riglee earned the Hallowed Be Thy Name Achievement. 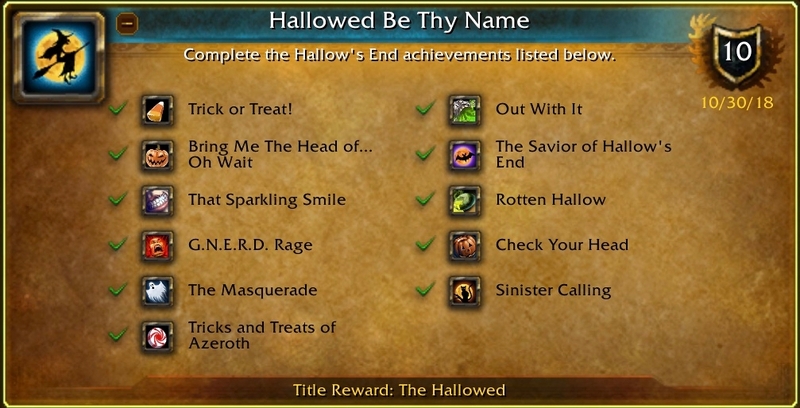 Hallowed Be Thy Name: Complete the Hallow’s End achievements listed below. I collected enough Tricky Treats to purchase a Hallow’s Eve Pet. Widget the Departed is a ghost kitty. What’s left for next year’s Hallow’s Eve? 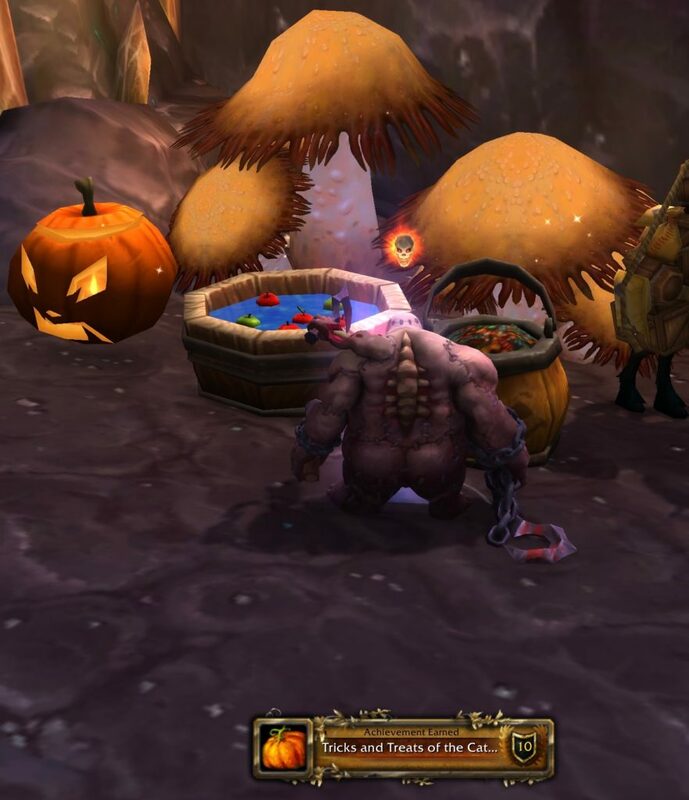 I could go visit Candy Buckets and gather up enough Tricky Treats to get another Hallow’s Eve pet. 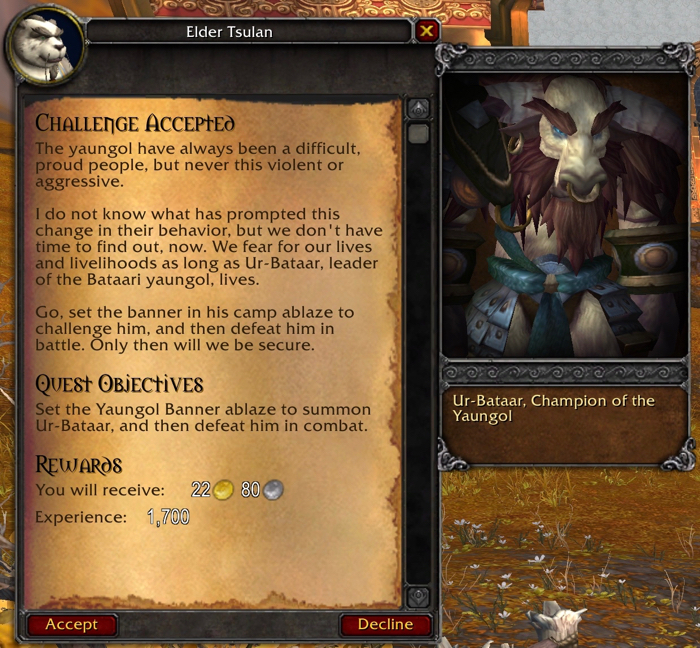 Or, I could try and get one of my alts through the Hallow’s End Achievements. Hopefully, by next Hallow’s Eve, Riglee the Death Knight will be at level 100. There is one more Hallow’s Eve Achievement (but it doesn’t appear to be required in order to finish the event). 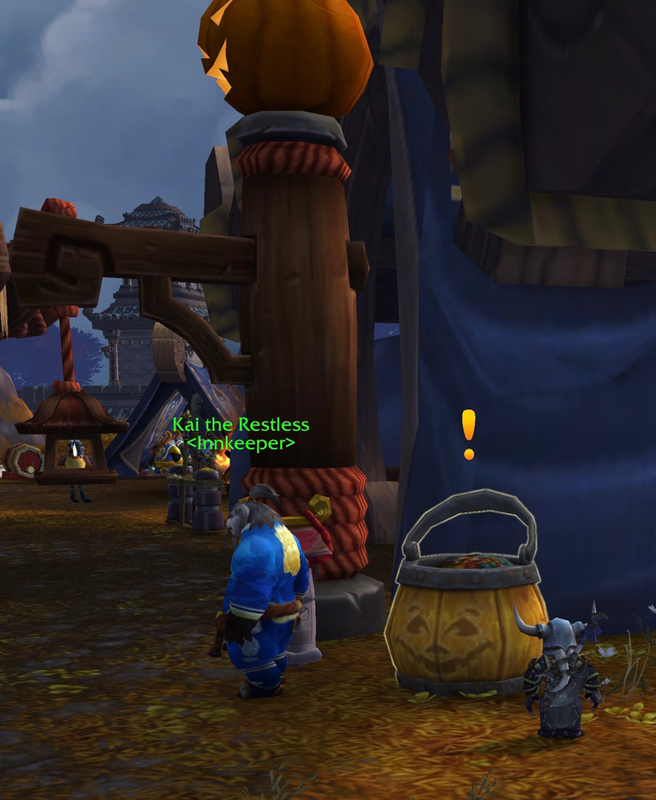 Characters who are Level 100 (or higher) can go find Scarecrow Pepe in their Garrison. Riglee wasn’t quite at Level 100 yet, so she could not get the quest that players have to complete before they can find Scarecrow Pepe. 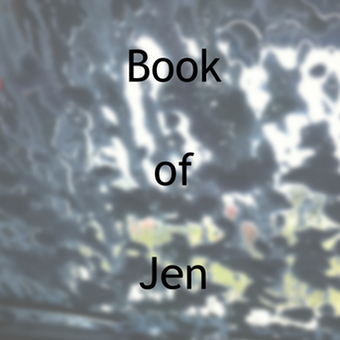 Riglee Finishes Hallow’s Eve is a post written by Jen Thorpe on Book of Jen and is not allowed to be copied to other sites.